Lock in a great price for Comfort Inn Edgewater – rated 8.3 by recent guests! The breakfast was delicious and the coffee was awesome. Everything was great. Would stay there again. The room was clean and the staff was friendly and helpful. Super clean hotel. Everything else was great,no complaints. The tub was comfortable as well as the beds. Breakfast was pleasant. Staff was professional and kind. They offered help to my family and I many times during our stay. Ill return for sure. Some rooms overlook the water. Thats a plus Shopping malls all within reach. By car or foot. Location of being river front to the Hudson River. Taylor at the front desk went out of her way to help me figure out how to take the bus and train in New York. She was awesome! Lovely breakfast and we had a room with a king bed and a balcony overlooking the water and NYC for only 10 extra dollars. Everything , the staff are very friendly and helpful . The rooms are clean and the beds are very comfortable. GREAT location . And good breakfast. Everything the room was clean bathroom was too. Loved how housekeeping kept the room clean and when we left every morning they would ask which one was our room and clean our room as soon as we left. Would come back to a tight room and made the bed. The room was clean and comfortable, and the location is excellent. Comfort Inn Edgewater This rating is a reflection of how the property compares to the industry standard when it comes to price, facilities and services available. It's based on a self-evaluation by the property. Use this rating to help choose your stay! George Washington Bridge is 2 miles from this Edgewater, New Jersey hotel. The hotel provides a business center and guest rooms with free Wi-Fi and cable TV. 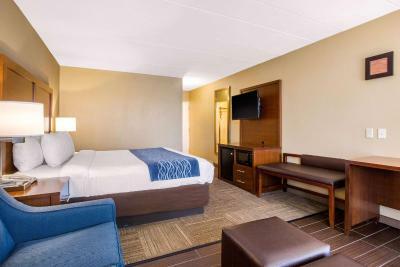 The rooms at Comfort Inn Edgewater are equipped with a microwave, refrigerator and 36-inch flat-screen TV. The hotel offers a daily breakfast with hot waffles. Free coffee is available in the lobby. Guests at the Edgewater Comfort Inn can relax in the picnic area. Yankee Stadium is 5 mi away while Columbia University is 7 mi from the property. The Meadowlands Sport Complex, a sports and entertainment facility and home to the New York Jets and New York Giants is 9.9 mi away. The Bronx Zoo is 8 mi from the Comfort Inn Edgewater. When would you like to stay at Comfort Inn Edgewater? This room features a flat-screen cable TV, free Wi-Fi, a microwave and a refrigerator. This family room has a microwave, flat-screen TV and air conditioning. House Rules Comfort Inn Edgewater takes special requests – add in the next step! Comfort Inn Edgewater accepts these cards and reserves the right to temporarily hold an amount prior to arrival. Please note, this property may pre-authorize the guest's credit card any time after booking. The cleanliness, location, big room, strong wifi, friendly staffs, excellent breakfast, many parking area, good facilities for disabled guest. Location is close to the supermarket and street. The river side view is superb with the view of Manhattan skyline, also good for jogging along river side. There is the nice neighborhood around. The staffs are really active and helpful. The personnel who works with breakfast always fill up the food, drink all the time. The check in is fast and convenient. There is the computer and printer for guest as well. There are the ramps and lifts in the front of hotel. The room is very big and super clean. The bed is really comfort. Wonderful. Breaskfast is superb with fried eggs, boiled eggs, and bacon or sausage. Many kinds of fruit. All tasty. This is the best inn I have stayed in USA! wall/door was too thin that we could hear everything what other guest was talking. One of the housekeepers “accidentally” took my husband’s phone charger. After speaking with the manager, it was returned to us. I didn't like the quality of the eggs. I also didn't like that the lemon water wasn't changed daily or at least every 2 days. Only item i wished wasn't over looked was having heated floors in the bathroom. Had to fix the toilet myself. Could hear loud music for hours when I wanted to relax. I put the do not disturb sign on my door and left for a few hours and when I returned I found that someone was in the room probably house keeping.